NICE has published final guidance confirming its approval of Gilead’s controversial blockbuster hepatitis C treatment Sovaldi – but Gilead and the NHS are still coming to blows over the treatment’s delayed implementation. NICE has concluded that Sovaldi (sofosbuvir) is an effective use of NHS resources, but because of its high price – £33,000 for a 12-week course of treatment – NHS England has asked for the deadline for services and funding to be in place to be extended until August, much to the frustration of Sovaldi’s maker Gilead. As a concession NHS England has committed to fast-tracking the provision of treatment to patients with cirrhosis (scarring of the liver) from April 2015, but details of this interim policy have not yet been released, further irking Gilead. “While we are pleased that NICE has recognised the clinical and economic value of treatment with sofosbuvir, we are concerned that the majority of patients will not gain access to this important medicine until later this year,” says Stelios Karagiannoglou, UK and Ireland general manager of Gilead. Sovaldi’s price has been a sticking point for various groups around the world. European charity Doctors of the World is challenging Gilead’s patent for the drug, hoping that it can open the door for generic treatments that could be produced for as little as £66. In the US, an employer is suing Gilead after spending $2.4 million on the treatment for its employees. At one point it even looked doubtful that NICE would approve the drug after internal NHS documents showed that some considered it to be unaffordable. 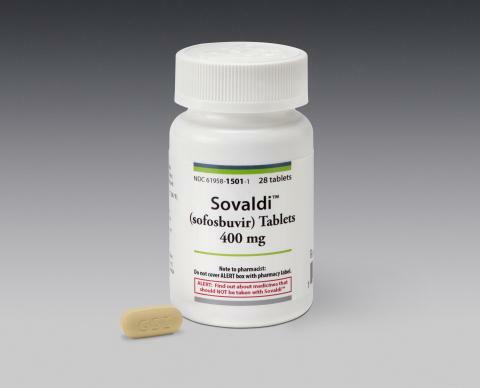 Gilead contends that Sovaldi’s benefits outweigh its costs – it is able to effectively cure 90% of patients in just twelve weeks, potentially leading to a reduction in expensive liver transplants. Doctors of the World however, has countered that “it is not acceptable that a pharmaceutical company set up the price of its product on the cost of the damage it could prevent”. The delay to Sovladi’s implementation only applies to England, and not Wales. In Scotland the Scottish Medicines Consortium approved the drug in June 2014.